This is one of many fine apple varieties which originated in New York state and became very popular in the South, particularly in Virginia. 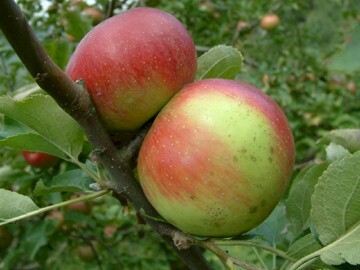 In 1791, George Wheeler of Penn Yan, New York, planted apple seeds in his orchard which produced several fine trees. In 1796, Abraham Wagener purchased the orchard from which arose the tree that today bears his name. It is an apple that, according to Beach, is a variety of “superior excellence.” It is a very fine cooking apple and an excellent dessert apple as well. Fruit is medium to large with thin, smooth, glossy pinkish-red skin overlaying a background of pale yellow. The yellowish-white flesh is firm, fine-grained, and very juicy. Ripens in October.